This entry was posted in Defence & Foreign Policy HKFP Buzz and tagged Handover Hongkong Post People's Liberation Army Hong Kong Garrison Philately Stamp on June 5, 2017 by HongWrong. 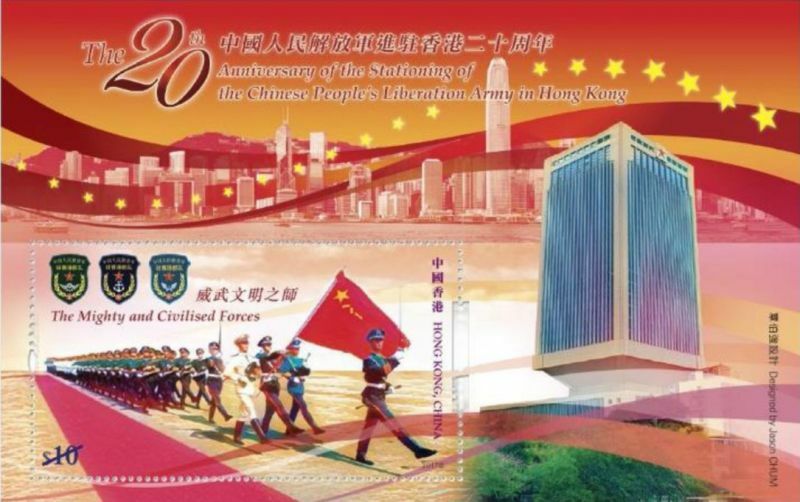 Hongkong Post announced that a set of postage stamps featuring the People’s Liberation Army’s Hong Kong Garrison will go on sale in a fortnight. The stamps commemorate the 20th anniversary of the stationing of Chinese forces in the city. The commemorative stamps. Photo: GovHK. Some 500 soldiers crossed the border at midnight on July 1, 1997, when the city’s sovereignty was transferred from Britain to China. This entry was posted in Defence & Foreign Policy HKFP Buzz Politics & Protest Video and tagged Donald Trump Taiwan Tsai Ing-wen Xi Jinping on December 18, 2016 by HongWrong. 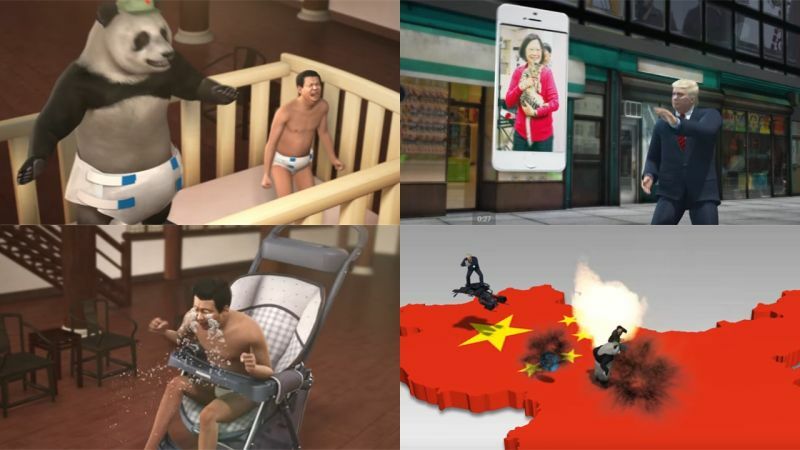 Taiwanese animators have given a cheesy take on the controversial call US President-elect Donald Trump accepted from Taiwanese President Tsai Ing-wen. The clip shows Trump and Tsai dancing with each other with their phones, as an infuriated Chinese President Xi Jinping shows up with a nuclear bomb. The video has been viewed more than 198,000 times, shared over 2,300 times and has received more than 2,200 reactions on Facebook as of Friday. The song is an adaptation of Love for the popular Japanese drama Nigeru wa Haji da ga Yaku ni Tatsu. This entry was posted in Defence & Foreign Policy HKFP Buzz Politics & Protest and tagged Donald Trump Taiwan Tsai Ing-wen on December 8, 2016 by HongWrong. This entry was posted in Defence & Foreign Policy HKFP Buzz and tagged South China Sea Wang Yi on July 13, 2016 by HongWrong. This entry was posted in Defence & Foreign Policy HKFP Buzz Video and tagged disputed islands South China Sea on July 12, 2016 by HongWrong. A musical video compilation of Chinese citizens defiantly stating “South Sea arbitration, who cares?” has gained over 3.5 million views. The video was posted on the Weibo account of Beijing news site dooo.cc on the day it was announced that the Permanent Court of Arbitration had ruled against China in its claims to resources in the South China Sea. It was also shared by the Chinese Communist Party Youth League’s account. This entry was posted in Defence & Foreign Policy HKFP Buzz and tagged Taiwan Tsai Ing-wen on May 26, 2016 by HongWrong. Chinese state media have once again blurred out the Taiwanese flag in a news video about the island state’s new president, Tsai Ing-wen. People’s Daily Online published a report about Tsai’s meeting with Assistant U.S. Secretary of Commerce Marcus D. Jadotte, noting that she struggled to gather her thoughts in Chinese. It is not the first time state media have obscured the Taiwanese flag. This entry was posted in Defence & Foreign Policy HKFP Buzz SinoBeat and tagged Liu Xiaoming queen elizabeth II state visit United Kingdom Xi Jinping on October 16, 2015 by HongWrong. Chinese President Xi Jinping and first lady Peng Liyuan will visit the United Kingdom next week in a state visit accompanied by plenty of pomp and circumstance. A state banquet will be hosted by the Queen in the palace ballroom to welcome the Chinese delegation. A horseshoe-shaped table will be extravagantly decked out with more than 100 candles in silver-gilt candelabra, along with some wholesome fruit and floral arrangements, which will be inspected personally by the Queen ahead of the dinner, reports China Daily. However, the menu of the state banquet, which is usually approved by the Queen in advance and catered to by more than 20 chefs, is proving to be slightly problematic.